Since its debut in 2006, AAITF has rapidly grown into Asia's largest trade show of the industry. In its 11th edition of 2015, the show hit a floor space of 120,000 sq.m and attracted more than 3500 brand exhibitors from 48 countries and regions, and 178,467 domestic and international visitors. AAITF is a brand exhibition for the automotive aftermarket which offers access to the latest models, products and trends within the industry. AAITF 2015 saw the attendance of over 3,500 brands, 20,000 new products and 30 high-end automotive industry activities. The feedback from buyers determined that they were exceedingly satisfied with both the products being exhibited and the events taking place within the show, and also credited the services offered by the AAITF Organising Committee. To summarise, buyers felt that AAITF 2015 was a resounding success, they believed it would fulfill their yearly procurement requirements whilst teaching them about the latest trends taking place within the automotive aftermarket industry. They were enthusiastic to become a part of AAITF 2016. AAITF 2016 - The 12th China International Automotive Aftermarket Industry & Tuning (Shenzhen) Trade Fair on 26th-28th February, 2016 at Shenzhen Convention & Exhibition Center, China. 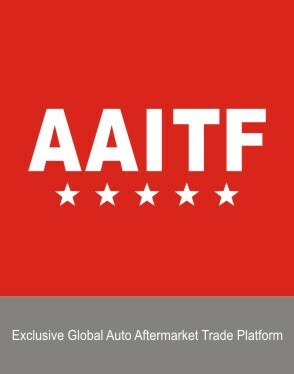 AAITF, as a brand exhibition of automotive aftermarket trade platform, integrates with SEMA’s Completeness and CES’ Innovation, aims to help you to get accesses to the new products, new models and new trends of the industry. In AAITF 2016, you will see over 20,000 new products released, more than 3500 brands will join us and 30 high-end automotive industry activities will be demonstrated in AAITF. As an international show, international players can find their business opportunities in AAITF easily. We hope to see you at AAITF 2018 !